Chennai city has a vast network of roads that helps in easy mobility in the city. There are as many as five national highways that leads to the adjacent cities like Kolkata, Bangalore, Trichy (Tiruchirapalli), Pondicherry and Tiruvallur. There are two bus services, inter city and inter state which are also known by the names Tiruvallur Transport Corporation and J.J.Transport Corporation. For long distances there are two main stands in the George Town called Express Bus Stand and Broadway. 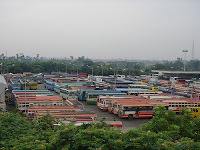 The inter city bus station called called Chennai Mofussil Bus Terminus (CMBT) has the distinction of being the largest in the whole South Asian region.A total of seven government owned transport agencies provide the inter city and inter state services. This is complemented by private service providers. Besides major bus stands there are many local bus stands. These stands are usually stationed at popular suburbs and tourist places in the city. The deluxe and video coaches provided by private enterprises are convenient means to access the nearby cities.